My CPU Is Loongson(Godson)!!! : Beryl 3D desktop on Loongson : Mission Completed! Beryl 3D desktop on Loongson : Mission Completed! Youbest, one of the most active Linuxers on Lemote BBS, successfully compiled and ran Beryl on Loongson Box, only two days after foxsen finished 3D driver. Beryl is still not stable on Loongson, nevertheless, it does run. Thanks youbest. 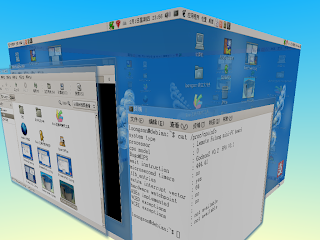 I don't think 3D desktop can do much for our everyday work but it may attract more customers to Linux-Loongson system. Very impressive. Hope it will be made stable and put on the lemote apt-packet server. Video for Beryl on Loongson!! !